Just like the human body organs, an engine has parts and they also subjected to ageing effects like human body parts but the difference is that when the human body parts fail, they hardly become normal while engine parts are subjected to wear and tear and can be restored. An engine consists of different smaller and larger parts, where some of them wear out fast and reduce the performance of the engine while on the other hand, some parts last longer, even more than an engine’s entire life. Similarly, when an engine fails, there comes the need of engine restoration or reconditioning. It is not a smaller deal, it is an exclusively expensive deal for many owners. Some owners to go for a new engine, others ask for reconditioning of their current engine. Unlike the new engines, reconditioned engines are a relatively cheap option. The engine reconditioning is a detailed restoration process which only experienced and professional mechanics can perform in a well-equipped garage. Only experienced servicemen can give the engine new life. 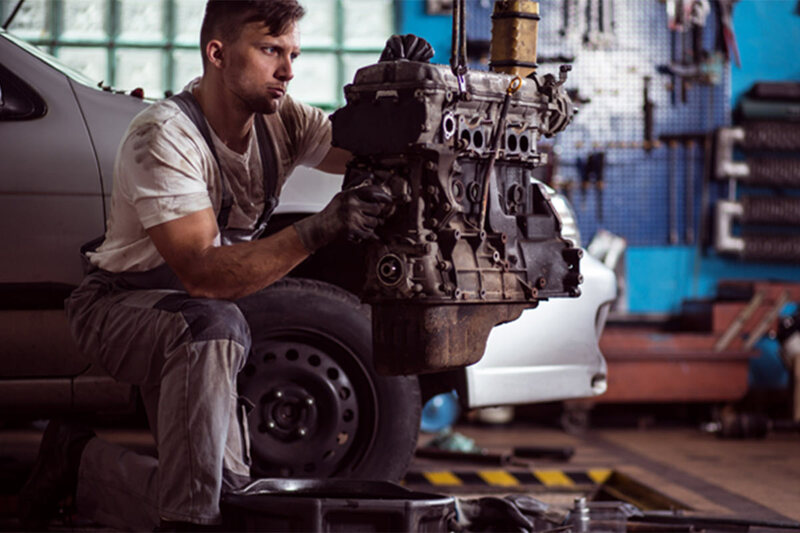 Once the engine reconditioning is done, it is also called engine remanufacturing and when this process starts, mechanics usually have two options, one is a partial reconditioning, but this option may depend on the overall condition of the engine. If the engine has a relatively good, condition and required some parts to be replaced or restored. Other option is called detailed restoration or reconditioning, where almost entire engine dismantled apart and analyse every part to make a detail report if any part requires replacement or restoration to give the engine new life. Once the reconditioning process is done, the engine is checked and tested for performance. Let’s see how the engine reconditioning process performed. When a failed engine or a breakdown unit brought to the professionals, the first step is to strip down the engine into parts to analyse the overall engine parts. Every part inspects to examine the condition and once the analysis is done. The cleaning process starts and all the parts placed into the hot acid tanks to clean out all the dirt on the parts. When all the debris from the engine parts removed, the engine parts take to the reconditioning station. At the station, the cylinder head is tested for the cracks and every valve is placed with the new ones. The cylinder head is one of the major parts of the engine, reconditioning experts analyse the cylinder head for cracks and hardness, by applying the pressure to see if there are any kind of cracks, leaks or even any blocked waterways. After that, a report made to see if the cylinder is able to be reconditioned or replaced. If reconditioning is the best solution, all the replaceable parts replaced with new parts where valves are not recondition able. The crankshaft is the backbone of an engine as it converts longitudinal motion of the pistons to rotary motion to revolve the gearbox and then the wheels of the vehicle. The crankshaft is analysed to see if the crankshaft has worn bearings or if it is cracked or even broken. In the case, if the crankshaft is broken, it would be replaced with the new crankshaft but in all other cases, the crankshaft reconditioned and restored to its original state. Crankshaft includes the big end bearings and the most common problem starts at the big end bearings. When big end bearings wear out, they produce the knocking sound. Any significant wear and tear in these parts can damage the engine badly and require urgent attention. In most cases, the bearings always require replacement because they cannot be repaired and machined. All the bearings removed from the engine block and replaced with the new bearings. The crankshaft then sent to the machine shop for reconditioning where the crankshaft restored to its OEM standards by polishing it. Parts like the connecting rods are cleaned and inspected by applying the special treatment to find any defects. After that, connecting rods tested for any twisting effects, bends, and cracks that can cause extra clearance for the oil and cause more issues. The treatment and restoration then applied according to the nature of the defects found on the connecting rods. The engine block is the main part of the engine that actually makes an engine body and handles all the parts and ancillaries. As you know that, an engine block handles extreme temperatures from the combustion process. Engine block at the same time give way to water and heat and this combination sometimes goes wrong and engine block faces heat stress which causes cracks in the engine block. After a detailed analysis of the engine blocks through x-ray scans, professionals decide it if there is a need to replace any part or machining would be enough to restore the engine block. The engine block then sent to the machining shop for performing the honing and boring process and the crankshaft is grounded and polished for an excellent gloss finish on the surface. All the inner surfaces of the engine block cleaned through excellent surface treatment. All the valves in the cylinder head showing any signs of heat treatment or burnet, they replaced with the new valves. Every valve guide inspected and restored to the OEM standards. All the gaskets replaced with the new gasket sets and oil seals replaced with the new seals. Good technicians always replace the oil pump with a new one. Engine block as described provides the base to the engine and problems with the engine block includes cracks caused by overheating or low oil pressure, when the vehicle gets too old, or it might cause by the insufficient maintenance or mechanical failure. It is not likely that you will need to replace the engine block, but it can be repaired and reconditioned in the engine workshop. Why Only Engine Reconditioning Specialist? It is necessary to give the engine new life that any engine reconditioning specialist must recondition it. It is also necessary that experienced and reputable service providers must recondition the engine. It can only happen if an owner makes an immense research online to find reputable engine technicians. They must have a reputation in the market and engine reconditioning industry. They must be the engine reconditioning leaders and have years of experience to perform the job. The mechanics must have industry’s most experienced operators utilising the latest equipment to perform the reconditioning. They must have an advanced machine shop for machining purposes. Their mechanics must have excellent knowledge of OEM standards, tolerances, and parts clearances to make sure that your engine would be reconditioned to the highest possible standards for long life. Whether your needs are for an individual component machining or for an entire engine reconditioning. During the reconditioning process, all the engines completely stripped down into parts and inspected to the micro level within the OEM tolerances and after that inspection, the above-mentioned process performed to reconditioning process.